​Billy Joe Saunders (25-0, 12 KOs) made his third defense of his WBO middleweight belt tonight at the he Place Bell in Quebec, Canada, taking on fearsome power-puncher and former IBF World middleweight champion David Lemieux (38-3, 33 KOs). Saunders won the WBO strap almost two years ago to the day, nipping Andy Lee by majority decision. 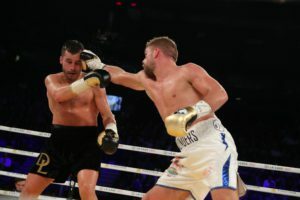 After lackluster performances against Artur Akavov and Willie Monroe, Jr., meeting David Lemieux on his home ground was a significant step-up in opposition for Saunders, and marked his first professional foray outside of the United Kingdom. A southpaw and counter-puncher, Saunders is notorious for his trash-talking and his willingness to try to win on points. ​David Lemieux is a more fan-friendly, pressure fighter who has knockout power in both hands. The match-up, a classic southpaw boxer vs. orthodox puncher, promised an intriguing show, and betting odds were virtually even going into fight week. The British media and fans were, not uncharacteristically, favoring Saunders, while most fight critics on this continent were leaning towards Lemieux. ​Saunders took the first round, boxing and moving, while Lemieux was trying to find his range, but Saunders confidence soared in the second, as the Englishman danced and landed almost at will. In the third, Lemieux gave the crowd something to cheer about, landing a few shots, but Saunders continued to outbox him. In the fourth, Saunders elicited boos from the crowd, moving around the ring, dropping his hands, not throwing punches, but he clearly won the round. The boxing lesson continued in the fifth, as Lemieux could not find Saunders, and Saunders managed the distance with ease. ​The one-sided nature of the bout continued: in the seventh, Saunders caught Lemieux with a good combination, snapping the Canadian’s head back. Then came a straight left down the pipe, staggering Lemieux, as though Lemieux had never sparred against a southpaw. And in the eighth, Saunders continued to be three or four steps ahead of the home town fighter. ​To put it simply, Lemieux had no answers to the puzzle in front of him. In fact, he never started to figure out Saunders, and could not cut off the ring — the only way to make progress against a fighter of Saunders talent and style. The judges saw it 120-108, 117-11, and 118-110 for Saunders. ​The featured undercard bout saw Antoine Douglas (22-1, 16 KOs) of Washington, DC, took on Gary “Spike” O’Sullivan (26-2, 18 KOs) of Cork, Ireland, in a ten-round middleweight bout. The colorful O’Sullivan, 33, lost to Saunders in July of 2013. Douglas came out in the first slowly and tentatively — nervous almost– and let O’Sullivan land on him frequently, despite appearing the faster fighter with quicker feet. The second round was a brawl, with both men throwing and landing big shots. The third was similar, as Douglas stayed in front of O’Sullivan, not using his feet to outbox the Irishman. ​In the middle rounds, both fighters continued to land heavy power shots upstairs, but Douglas was absorbing a number of big right hands from O’Sullivan. The end came in the seventh as O’Sullivan caught Douglas against the ropes and batter him to the canvas. A dazed Douglas beat the count, but the referee wisely called off the bout. 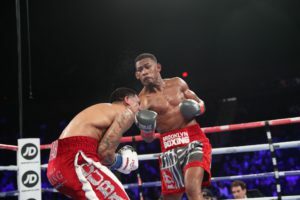 ​Earlier in the evening, undefeated Cletus “The Hebrew Hammer” Seldin (21-0, 17 KOs) took on Yves Ulysse, Jr. (14-1, 9 KOs), in a ten-round super lightweight clash. With a combined seventy-two percent KO average between the two fighters, this one wasn’t likely to go the distance. Seldin, from Long Island, NY, fought last month on the undercard of the HBO broadcast of Jacobs vs. Arias, and has built up something of a cult-following in the Metro area. ​Unfortunately for the “Hammer,” Ulysse’s superior movement and hand-speed exposed Seldin as a one-dimensional slugger. In the first round Ulyssse scored his first knockdown, beating Seldin to the punch inside. In the second round, the Canadian fighter timed Seldin with a beautiful straight right, and, in the third, a combination uppercuts and hooks thrown in wicked succession dropped Seldin again. The Long Island man showed a ton of heart, especially in a brutal tenth round where he took significant punishment, but he was simply outclassed by a fast, fluid, and talented Yves Ulysse. The final scores: 99-88 across the board for Ulysse.